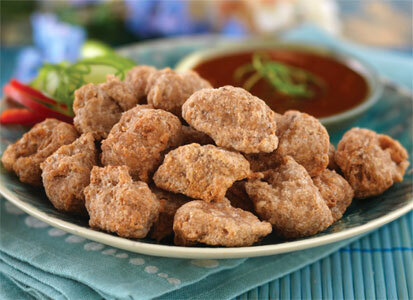 Vegetarian Plus brings you the Asian street food favorite as a vegan dish with their Vegan Popcorn Chicken! Featuring a crispy crust with tender and juicy vegan "chicken" inside, these bites are great either served as an appetizer or entrée, and are perfect for dipping in your favorite sauce. Weather you're a fan of BBQ, sweet chili, vegan "honey" mustard or just good 'ol ketchup, dunk them any way you like for a great dish any time, and to get them extra-crispy, toss them in the air fryer for the ultimate experience! 9 oz. (252g) package is $9.99.